NEW!!! 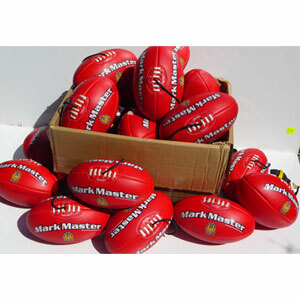 Ladies and Youth Boys both play with a Size 4 AFL Football – FREE Postage included in Price. 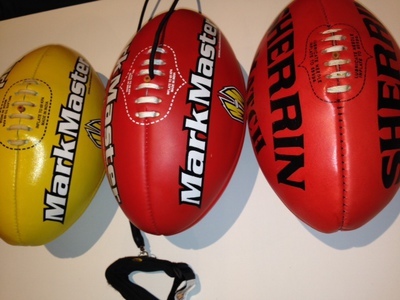 The BEST SELLING AFL Training Football is the Mark Master size 4 training ball. This is the correct size ball for those youth boys 13 to 15 years and the Ladies. For girls and ladies playing Senior ALF footy, this is the size football you both train with and play footy with on game day. A men’s size 4 football. 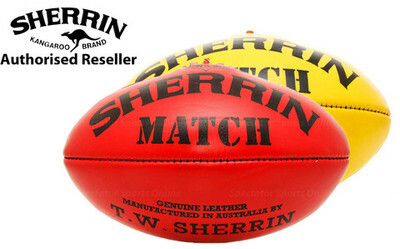 Girls there is no other Aussie Rules Training Ball like this ball, you can practice on your own, in the back yard, in the park, or at training. No more wasted time running after the ball. This ball comes back to You!! Practice, Bouncing the ball, Handball, Marking and Kicking with your Left and Right Foot. You will be Amazed how Quickly Your Football Skills Increases. 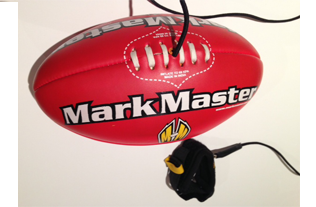 The Mark Master Training Ball is also perfect for those who have to limited space to play in. The comfortable wristband is attached to the wrist. 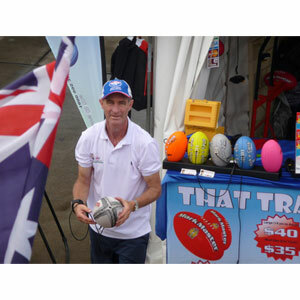 The Training Ball will only travel up to 4 metres. 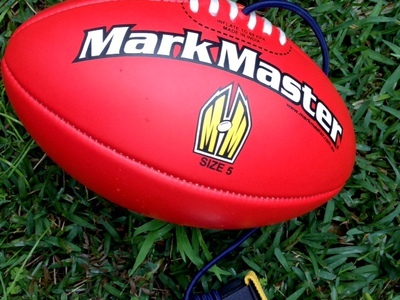 Anyone can use the Mark Master in a small backyard safely without the football disappearing over the neighbour’s fence, on the road, or on the roof. Invest in your sporting success to be the Best Player you can be. Attached to the wrist band to your Left or Right wrist. If you kick with your Right Foot.. place the wrist band on the Right Wrist. If you kick with your Left foot, place the wrist band on your Left Wrist. 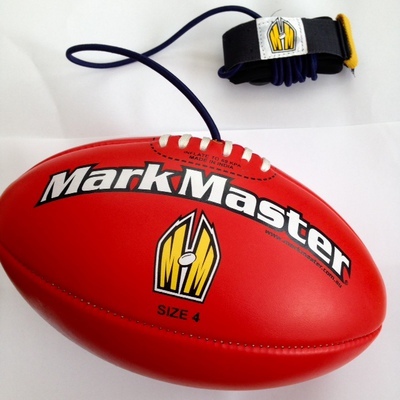 The Mark Master Training Ball allows the user to play alone. There is no need to drag brothers, sisters, parents or friends to the park to have a kick of the footy, instead they can spend hour after hour, day after day honing their skills. If your recovering from an injury, this Training Ball will definitely HELP You. When a player has mastered these skills while walking, try doing the following skills while running. Bouncing the ball, kicking the ball, and then marking the ball on the run. 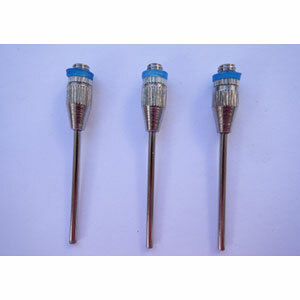 FREE SHIPPING FOR AUSTRALIA ONLY. Delivery can take between 2 to 7 working days. 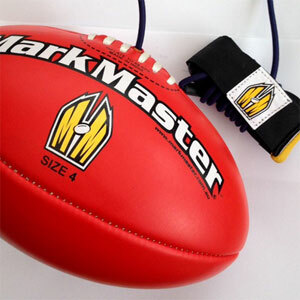 If your NEW to AFL this Training Football is a Must Have!!! If your recovering from injury the Training Ball will HELP You. 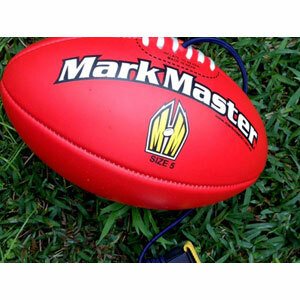 This is a Training Ball you can used at Home, In the Park or at Training. We often wonder what our customers are calling our training footballs. 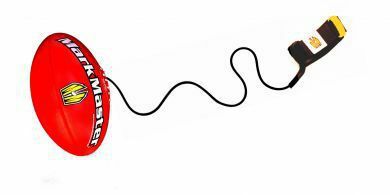 You will hear them called: Ball on a string, Mark Master, bungee ball, football drills ball and ball on a rope, ball on a string, come back ball, football skills ball. I play for South Broken Hill – We have 4 clubs in town (South, North, Central, and West) and they all started a women’s team in 2012. There aren’t a lot of girls out here that do have training balls yet, more so the few of us that hate waiting for preseason to start, but our coach is looking to use them a bit this year, particularly with our newer players who haven’t really kicked a ball before. It definitely helped me last year, I missed majority of pre-season with an ankle injury but did spend a bit of time kicking that ball.. or similar ones of my teammates and I had my best season yet, improved my kicking and marking heaps! Thank you so much! I loved it the couple of times I was able to use it last year. It kept my skills up while I was in a moon boot and the rest of the team was training!